Scuffles broke out and police used teargas during a mass rally in Athens on Thursday as Greeks railed against government pension reforms needed to meet the demands of international creditors. Demanding an end to austerity, about 50,000 Greeks marched peacefully on parliament in central Athens chanting for the government to ditch the proposals, which many see as a betrayal of the leftist values of the main governing party, Syriza. Public health workers carried black balloons, and a large banner depicting a hunched-over nurse with a walking stick. "This is retirement at 67," it said, a reference to the later pension age that will come from the reforms. Breaking away from the main march, black-clad youths hurled stones and petrol bombs at police, who responded with rounds of teargas and stun grenades. Some of them smashed bus stops and set a car alight after the march, during a cat-and-mouse game between police and protesters in the back streets of central Athens. The angry backlash is piling pressure on leftist Prime Minister Alexis Tsipras, first elected just over a year ago. With just a three-seat majority in parliament, he is stuck between either pushing the reforms through to appease international creditors, or attracting the wrath of thousands of Greeks. "They should be strung up here, in Syntagma Square," said pensioner Nikos Ghinis as he walked along with thousands of others in central Athens. "I'm getting 740 euros [US$826.21] a month for 40 years of work … I'm [demonstrating] here for my children and grandchildren," he told Reuters. It was the second nationwide walkout since Tsipras took power in January 2015 on a pledge to end years of austerity, only to cave in under the threat of expulsion from the euro zone and sign up to new belt-tightening reforms under an EU-IMF bailout package worth up to 86 billion euros. "They are raiding our souls not just our pockets," said 70-year old George Stathopoulos. "They betrayed us." The 24-hour strike coincides with a major review of Greece's performance on terms of its bailout. The heads of the European Union and International Monetary Fund mission assessing Greece's progress arrived in Athens earlier this week to discuss the pension plan, tax reforms and bad loans weighing on Greek banks. 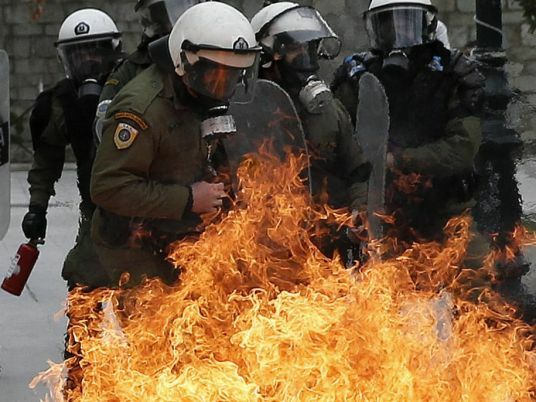 Greek ministers were in talks with the mission chiefs in a hotel near Syntagma square, when the clashes erupted. The government wants to conclude the review swiftly to start talks on debt relief and convince Greeks that their sacrifices are paying off after six years of austerity and a deep recession that have brought the jobless rate to 25 percent. Greece's economy will be the only one in the European Union to shrink this year, the EU Commission said on Thursday, but the fall is much smaller than previously estimated. Greece has promised to cut pension spending by 1 percent of GDP, or 1.8 billion euros, this year. To protect retired people whose pensions have been slashed 11 times already since 2010, the government plans to increase social security contributions by employees and employers. But unions say the new plan will increase unemployment as the costs for hard-pressed businesses will go up, and will force workers, mainly the self-employed, into tax evasion as it links social security contributions to declared income. Under the terms of pension reform, social security contributions will increase almost threefold in coming years.